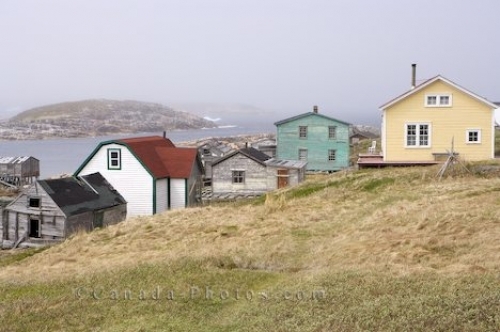 A mass of houses set along the waterfront in the historic fishing village of Battle Harbour in Southern Labrador, Canada were once used by the permanent residents on this island. In 1970, a fishery was opened at Battle Harbour and it was about five years later when the first permanent settlers came ashore to the island. The community continued to grow around 1820 and houses were built along with schools, churches and small shops. The owners of the fishery sold out in 1871 and then again in 1955 until the fishery started to decline. In 1991, the fishery was stopped and most of the permanent residents relocated to various places throughout Southern Labrador leaving the island nearly abandoned. In 1992, Battle Harbour Heritage Properties took over the island and put many hours into restoring the buildings to create the unique tourist attraction it has become today. Picture of the waterfront houses in the historic fishing village of Battle Harbour in Southern Labrador, Canada. Visitors can explore the houses and the various historic buildings used in the fishing village at Battle Harbour from the middle of June until the middle of September if the ice pack has thawed enough for the ferry to cross. Houses of residents from the historic fishing village of Battle Harbour situated on Battle Island at the entrance to the St Lewis Inlet, Viking Trail, Trails to the Vikings, Southern Labrador, Labrador, Atlantic Canada, Canada.